For 95 years this face has been all over kitchens across America!! 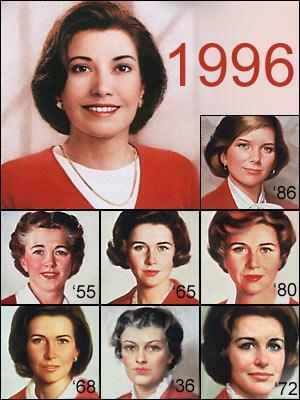 For many years I thought Betty Crocker was a REAL MOM, not an iconic figure. I read an article in the Star Tribune a few weeks ago that stated General Mills baking department has had a declined in sales. I’m not surprised at all because we are become more health conscious and thinking twice about buying a box of sugar to treat our families. Elizabeth Nordlie, VP for baking at Golden Valley General Mills knows this is the new trend, but thinks people are busy and will still go for the box for a quick fix so they can “delight their family with home-baked goodness”. So General Mills solution to declining sales is, lower prices to beat their competition! WHY?? How about you try and figure out a way to make your boxed baked goods a little bit healthy? I’ve learned to bake my own yummy treats for my family, while they usually use some form of sugar, I try and make the best choices possible for the health of my kids! Shame on you Ms. Nordlie for taking the easy road to increasing sales!!! If a regular mom can figure out how to clean up some recipes, don’t you think a very large corporation like General Mills can do it too? ?